In the story The Infinite Sea by Rick Yancey, the second book of The Fifth Wave, a group of survivors camp out in a hotel while Ringer scouts the area to make sure there are no aliens around and to find a place to stay. Teacup, a seven year-old girl, decides to follow Ringer, since she looks up to Ringer and was good friends with her, but ends up getting shot. They are both captured by Vosch, who is half alien and half human and wants to wipe out human race. Meanwhile, Evan Walker, the person Cassie loves, finds Cassie, Ben, Sam, Dumbo, and Poundcake’s hideout. Vosch decides to send Megan to them with a bomb in her throat that only half alien people can disable, but Evan manages to disable it, proving that the group has an alien with them. Ringer, who is still captured, becomes the “12th System” or half alien, and then tries to escape with Teacup and Razor, the person taking care of Ringer. Later on, after she escapes by jumping off a plane without a parachute, Ringer realizes Razor had betrayed her and everything was just a test to see if the 12th system worked. Back at the hotel, Cassie, Dumbo, Sam, and Ben escape from Grace, a superhuman, who kills Poundcake. I found the first section of the book very interesting because of my excitement of the release of the second book in The Fifth Wave series. 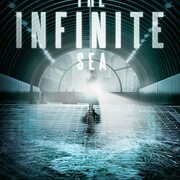 Although the beginning really gripped my attention, The Infinite Sea wasn’t as action-packed as the first book. Some parts of the book were boring with less crazy events going on replaced with dialogue and unimportant events. Although it in a dull way, I thought this book was very well explained, so I wasn’t confused. The many plot twists were very astonishing and made the book more intriguing. I would recommend twelve to fourteen year-olds to read this book because this book contains a wider range of vocabulary. I wouldn’t read this book again because most of the book was not very riveting and did not keep me engaged enough so that I would be dying to find out what would happen next. Because how uneventful the story was, I would rate this book a 6 out of ten. 1. What is Ringer’s real name? 2. Who did Ringer accidentally shoot? 3. What did Sam do when Cassie confirmed their father was dead? 4. Who shot Cassie in the knee? 5. Why did Teacup leave? 6. Why isn’t Grace killing Evan? 7. Why did Evan lose his gift (super advanced senses and strength)? 9. Why can’t Poundcake talk? 10. Who is Megan and why was she sent to the group of survivors? 11. Who does Marika/Ringer see before she wakes up? 12. What game does Razor and Ringer play? 13. What does Vosch turn Ringer into? 14. Who helps Ringer and Teacup try to escape? 15. How does Ringer calm down Lieutenant Bob?